So uh... I never actually thought I would make this post, but... here I am. In November of 2012, I stumbled upon ADK's Battlefield 3 '24/7 Operation Metro - No Explosives' server. I fell in love with the server, applied for ADK, and was accepted soon after. I was a little nervous about being in a large community of gamers, and felt like the new kid at school. If I remember correctly, I would join the ADK Teamspeak, join a Battlefield channel, and not say anything. I tried to lurk, but people kept talking to me, and I eventually got comfortable. I started speaking with people a lot, and began to make friends. It felt like I had found a family and a home. With all of the great times I had, and all the amazing people I met during my time in ADK, I was one hundred percent sure that ADK would always be my home; I would never leave this community, my friends would never leave, and ADK would never fail. However, ADK is no longer what it was when I joined. In almost the four years since I've been here, the community has immensely changed. There is no longer a lighthearted feeling to the community, rather a serious tone. In regard to recent events, it is time for me to bid farewell to this community. The majority of my friends have left, and I no longer have a desire to remain within this community. Thanks for the good times. I absolutely agree with you, @War_Adm1ral. I enjoyed running Overwatch with you, and I hope I'll still see you around. Welcome to the ADK forums, @c0ffi124! If you'd like to play Overwatch with a group of people, feel free to join us on Teamspeak in the Overwatch channels! Also, if you're interested, check out our Overwatch forum. Welcome to ADK, @Cronger! Feel free to join us in TS in the Overwatch channels and queue for matches with us! Also, if you're interested, check out our Overwatch forums. Welcome to the ADK forums, @eXStoerm! Feel free to check out our Overwatch forum and join us on TS in the Overwatch channels to queue for some matches. @-QR-Duke, thanks for sharing your first game! It looks like you guys had a ton of fun. Feel free to join us down in the Overwatch channels and queue up with us! FIGHT FOR THE FUTURE Soldiers. Scientists. Adventurers. Oddities. In a time of global crisis, an international task force of heroes banded together to restore peace to a war-torn world: OVERWATCH. Overwatch ended the crisis, and helped maintain peace in the decades that followed, inspiring an era of exploration, innovation, and discovery. But, after many years, Overwatch’s influence waned, and it was eventually disbanded. Now, conflict is rising across the world again, and the call has gone out to heroes old and new. Are you with us? Hey everyone! As Many of you know, Overwatch was released on May 23rd, and ADK would like to invite everyone to join us in the Overwatch section! With this article, we’re trying to update as many people as possible about what is going on in the Overwatch section. With this, we’ll provide you with information about joining us via Battle.net with your BattleTags, Overwatch Recall Nights, and more leadership for the section. Overwatch is a fun game if you’re queuing by yourself. However, it’s much more fun playing in a full lobby. In the Overwatch section, we would love to play with as many people as we possibly can, and people are always looking for a group to queue up with. To make it a little easier for people to find each other, we have created a thread to post your Battle.net BattleTag, which you can find here: The second thing we would like to cover is what we are calling “Overwatch Recall Nights”, which will be our community events. These events are being planned to get as many people playing Overwatch together as possible. We would like to have these events at least once a week, and currently have polls out for the game modes people would like to play the most, as well as the nights that work best for everyone. If you are interested in these events, please take a few minutes to select the option in each poll that works best for you. Lastly, we are looking to expand the Overwatch section, which requires more leadership. If you enjoy playing Overwatch, and would like to make sure the section grows to its fullest potential, please read and comment on this topic: Overwatch is a growing section in ADK, and we plan to increase its activity by adding people on Battle.net to join lobbies, creating events, and adding more people to our leadership team. We hope many of you will join us for some fun in the Overwatch section! @Aaron Rainey, welcome to ADK! Feel free to join us on TS and queue with us in Overwatch! If you want to add me on Battle.net, my BattleTag is MrSnipe1#1903. 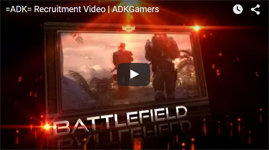 Welcome to the ADK forums, @MrBlackBeard! Come check out the Overwatch section in TS! Feel free to add me on Battle.net (MrSnipe1#1903) and come queue with us! Welcome to ADK, @Shokhenah! Glad to see another person interested in Overwatch! If you want to add me, my BattleTag is MrSnipe1#1903, and I'll definitely queue for some matches with you. Feel free to jump on TS and hang out with us in the Overwatch section!